Keeping a few house plants around your home or office adds a nice touch of the outdoors, and provides green foliage to admire even in the middle of winter. There are a variety of house plants that feature short trunks or stalks, resembling small trees. Some grow to great sizes, while others stay small and compact. Ficus benjamina, also known as weeping fig, is part of the ficus family, which includes other varieties that do well indoors. 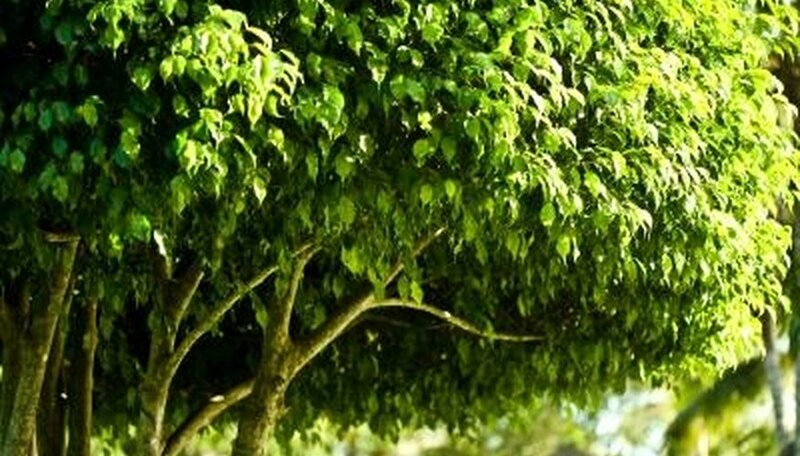 The experts at Denver Plants say ficus benjamina can grow to 100 feet tall outdoors but will stay small and grow slowly indoors. This tree is often found at garden centers or specialty gift stores with a braided trunk, which is done while the tree is just beginning to grow. Ficus benjamina needs at least half a day of full sunlight. Water should only be given when the soil is dry an inch below the surface. Trim off leaves that die or turn yellow to keep the plant looking its best all year long. The dwarf version of the Hawaiian umbrella tree, or Arboricola schefflera, makes a perfect bonsai tree, according to Bonsai Gardener. It grows well in the low light of most indoor environments and stays small enough to be placed on a desk. Small banyan-style roots emerge from the trunk for an interesting look. It has high water requirements, and the soil should not be allowed to dry out. The tree produces bright red blossoms in late winter or early spring. This plant will stand up to occasional trimming if you wish to shape it as a bonsai, or you can let it grow on its own. All parts of it can be poisonous, so keep pets and children away. The Dieffenbachia seguine plant has one large green stalk that supports multiple glossy leaves, adding a tropical look to any home. The University of Arkansas Division of Agriculture says that this plant survives in the low light and dry environment of a home or office. It can reach 6 to 8 feet tall, and requires watering only when the first inch of soil is dry. Modern varieties grow slowly but steadily. A number of smaller stalks may emerge before the central stalk begins to gain height. This plant is found on most poisonous plant lists because a component of its sap causes irritation if touched or consumed, but no known deaths have been linked to the plant.